When you bring your animal to the vet there are a few questions the vet will ask that are essential to determine when and if the lump will be removed. 1. When did you notice the mass and has it grown since noticing it? Masses that grow quickly will invariably need to be removed regardless of the cells that make up the mass. The reason for this is that it will only continue to enlarge and may eventually lead to impaired function of the area of the body it is growing from or may cause discomfort and become more difficult to remove later on. 2. Is the lump bothering your pet, are they scratching, biting or licking it? Any lump that bothers your pet is causing them discomfort and this is the last thing we want. It also predisposes them to infections in the area as the licking and scratching will traumatise the mass with a subsequent breakdown in the skin’s protective barrier. 3. Has your pet ever had any other masses that were of concern? Certain growths on the skin, mast cell tumours for example, do have a tendency to regrow or spread to other areas. Once the vet has gained sufficient information from the pet owner, a more in-depth assessment of the lump will commence. Usually, a visit to the vet will start with the vet obtaining a history from you regarding the pet’s health which will then be followed by a physical clinical examination of your pet. The vet will then examine the appearance of the lump and determine if there are any other lumps present on or under the skin. The appearance of a mass may give a clue as to what the mass might be. A small round firm lump may simply be a cyst. Small superficial wart-like growths on the skin surface are often benign and only need to be monitored. If they are injured or bleed, they may have to be removed. A dermal cyst may eventually rupture discharging its contents and resolve on its own. A dermal cyst may however re-occur and the only way to get rid of it for good will be to surgically remove it. Once the vet has had a look at the appearance of the mass they will then most likely perform a fine needle aspirate. This procedure involves placing a needle into the mass with a syringe attached to the needle. The plunger of the syringe is drawn back and with some luck, a small sample of the cells making up the lump will be drawn into the needle. Once this small sample of cells is obtained it is sprayed onto a glass slide for fixing, staining and observation under a microscope. It is rare for the vet to make a definitive diagnosis of what type of growth and how aggressive it is with a single or even multiple fine needle aspirates. However, the small sample of cells obtained may give the vet an idea of the type of cells making up the growth and how urgently it needs to be removed, if at all. There are three types of lumps which can generally be identified more accurately based on these small samples which are, lipomas (which is a benign fatty growth not considered to be a cancer), mast cell tumours (which is a bad type of cancer) and a melanomas (which is a really bad type of cancer). The exclusion of these three types of growths already helps somewhat in determining a prognosis. If it does turn out to be a mast cell tumour or a melanoma, the grade and the subtype of these masses will still need to be determined so just identifying it is not enough. Generally, the vet can determine the type of cells present, for example, a round cell tumour, which may be present in a number of specific growths, but the final diagnosis of which type of round cell tumour and the stage cancer can only be definitively identified by histopathology. Histopathology is where either the full growth or a portion of it is removed surgically and sent to a specialist pathologist who then examines the tissue sample sent with high-resolution microscopy and makes a definitive diagnosis. Round cell tumours generally have to be removed surgically as they grow quickly and are locally invasive into surrounding tissues. Other cell types that may be seen are spindle cells, epithelial cells, glandular cells, fat cells etc. If a cyst is aspirated then one will only see cyst material or debris and no obvious cells. If these lumps are subsequently gently squeezed, the contents of the cysts will be extruded. Any lump or bump which is cancerous should be surgically removed and sent for histopathology for definitive diagnosis and grading. This is also important to ensure that the surgical margins are clear which means that all cancer cells were removed and none of the growth was left behind. This is particularly important for very aggressive tumours such as mast cell tumours, as they invade the surrounding tissue easily and to a large extent. To remove these tumours, a margin of 3 cm around the entire mass, and 2 tissue planes deep have to be removed by the surgeon. The resulting wound to be closed after surgical removal of a tumour can be very extensive with a high risk of post-operative complications. It is with these masses, as you could imagine, that the smaller the growth, the better it is to catch it early. cases of wart-like growths on the skin called adenoma’s. Unless they have been traumatised by the animal scratching, biting or licking them or where they have grown too large, it does not have to be removed. dermal cysts come and go and unless the owner wants them permanently removed, they do not need to be surgically removed. the very common growth known as a lipoma, which is a soft lump underneath the skin which is usually not firmly attached to the underlying tissues and do not seem to bother the animal at all. A lipoma is, in essence, a tumour of fatty tissue, but it is benign and only grows locally. Lipomas are generally benign, well-encapsulated growths which do not invade surrounding tissues and they can sometimes grow very large, sometimes up to the size of a rugby ball, without posing any systemic risk to the animal. The problem is that they become a physical problem which interferes with the animal’s sitting or lying down or movement. 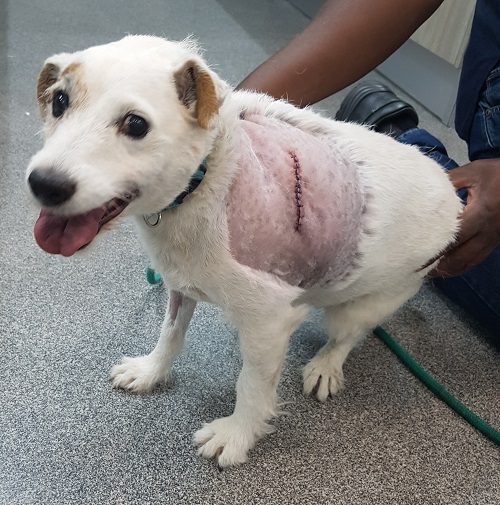 Smaller lipomas can initially be monitored and not removed, but should they continue to grow, it is advisable to get them surgically removed before they start to interfere with your pet’s ability to move and live a normal comfortable life. In conclusion, when you find a lump or bump on your pet, rather take them to the vet to have it checked out so that it can be diagnosed and treated. If advised by the veterinarian to remove the growth, it is always better to do it sooner rather than later. Lastly, remember that no growth is too small to be ignored.